There are fee-based apps available to keep track of crop production data (users pay a monthly service fee). Another option is to use a spreadsheet app to create your own forms. A spreadsheet is a useful tool for keeping track of pests or crop information in greenhouses. Examples include "Google Sheets" and "Microsoft Excel app". Some growers are using Google Sheets to record pest counts which are then shared between staff. Search "spreadsheet apps" for more options. 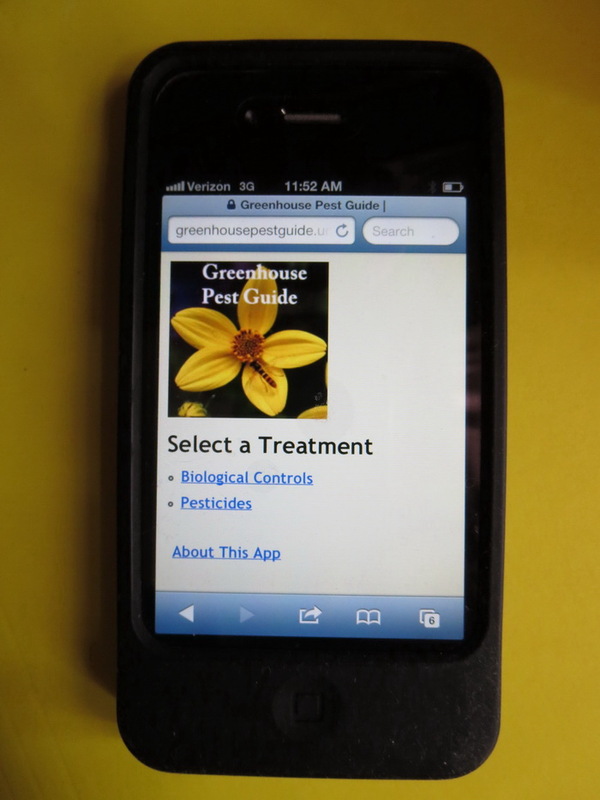 Our Greenhouse Pest Management App for commercial growers of greenhouse crops and flowers was created by Tina Smith, University of Massachusetts and Leanne Pundt, University of Connecticut. This is a pest management reference guide that contains options for using biological control and pesticides. Partial support for this project provided by the New England Florist Association Floriculture Applied Research Fund. Our Greenhouse Disease Management App for commercial growers of greenhouse crops and flowers was created by Bess Dicklow, University of Massachusetts Plant Diagnostic Lab and Tina Smith, University of Massachusetts Extension. This is a disease management reference guide that contains options for using biological control, organic and conventional pesticides. Partial support for this project provided by the New England Florist Association Floriculture Applied Research Fund. An easy to use calculator for figuring stock solutions for injectors. Search "Greenhouse Scout" on the App store on ITunes. Summary of information on biocontrol of common greenhouse insect pests and an interactive interface for collecting, organizing, and presentation of scouting data, and product application for insect management. Gro Getter (ITunes) from Ball Horticultural Co.
Plant search and information for commercial growers and retailers for many horticulture crops. Guideline for the integrated use of biological control agents & pollinators in combination with crop protection products. Allows user to find pesticides compatible with specific biologicals. Users select which diagnostic lab they would like to submit samples to, fill out relevant information and submit up to six digital images to be sent to the diagnostician via email. Participating Universities include UConn, Purdue, University of New Hampshire, Ohio State University, Auburn University, University of Illinois, University of Kentucky, and Michigan State University. All types of plants and plant problems can be submitted. Images can be submitted for plant or insect identification and for disease diagnosis. Some labs may charge a fee. Link or search "PGR calculator, OHP" The PGR Calculator will allow the user to look up current PGR rates in ppm for spray or drench applications. The grower then enters the desired dose and the size of the application area, or the number of pots for a drench and the app calculates the amounts of solution and product needed. Enables tracking of all trial activities, from plant measurements, crop data points, plant treatments, and more.